There are few methods that express love as eloquently as speech. Hence, a newly-wed couple who have the misfortune of living apart for some time will often compensate for their separation by remaining glued to their phones, speaking to each other for hours on end. On the contrary, when two people have hatred and enmity for one another, they make it a point to avoid speaking to each other. During the month of Ramadhaan, Muslims the world over remained glued to the Quraan Majeed, earnestly conversing with Allah Ta‘ala. 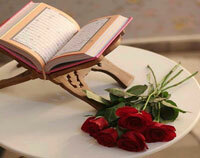 The more they recited the Quraan Majeed, the more their love for Allah Ta‘ala grew and the closer to Him they became. However, how many of us have continued to converse with Allah Ta‘ala, through reciting the Quraan Majeed daily, as we used to in the month of Ramadhaan? Similarly, how many of us are still conversing with Allah Ta‘ala through the direct-line of du‘aa, as we used to during the month of Ramadhaan? When a person has a close, bosom friend, and this friend suddenly gives him the cold shoulder, it greatly perturbs and hurts him as his beloved friend is now treating him as an enemy would. When we earnestly conversed with Allah Ta‘ala and did our best to gain His nearness in the month of Ramadhaan, then what message is sent out when after the month of Ramadhaan, we seldom recite the Quraan Majeed and rarely raise our hands in du‘aa? Are we showing Allah Ta‘ala a cold shoulder’ (may Allah forbid!)? Just as we would not appreciate our near and dear ones suddenly abandoning us, we should not suddenly abandon our relationship with Allah Ta‘ala, who is the Most Beloved and Dear to us. Instead, if we strive to maintain our relationship with Allah Ta‘ala, our love and bond with Him will grow until the next Ramadhaan, during which it will be boosted and increase even further. In this manner, we will become closer and closer to Allah Ta‘ala until He eventually summons us from this world.